Daily Illuminator: Host A Spooky, Sweet Ghosts Love Candy Event - For Free! May 4, 2017: Host A Spooky, Sweet Ghosts Love Candy Event - For Free! Want your game store to become haunted . . . by adorable ghosts who just want to eat candy? We can help with that! In our upcoming game Ghosts Love Candy, cute cartoon specters compete to haunt trick-or-treaters on Halloween night. Victory goes to the ghost who gets the most of their favorite sugary treat. 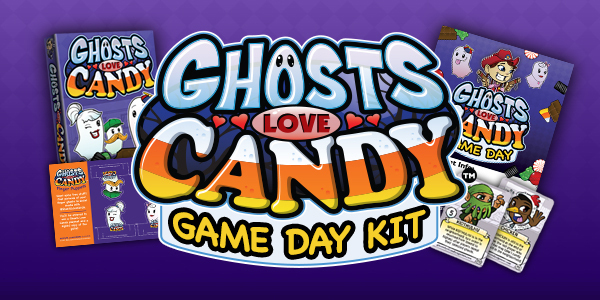 If you're a retailer, sign up your store for our #PlaySJGames Ghosts Love Candy Game Day retail kit. It's completely free and comes with a demo copy of the game, lots of great promos to give away, and an 18"x24" event poster to get those ghosts into your store! If you're a player, let your favorite FLGS know about the kit! You can send them the link to the sign-up form or to this blog post. But hurry. There's only 200 free, candy-loving, ghostly event kits available, and they're going fast!